A remastered 2-in-1 edition of the all-time classic hit from one of Japan's most beloved creators, available for the first time in a format faithful to the original work. One day, teenage martial artist Ranma Saotome went on a training mission with his father and ended up taking a dive into some cursed springs at a legendary training ground in China. Now, every time he's splashed with cold water, he changes into a girl. His father, Genma, changes into a panda! What's a half-guy, half-girl to do? 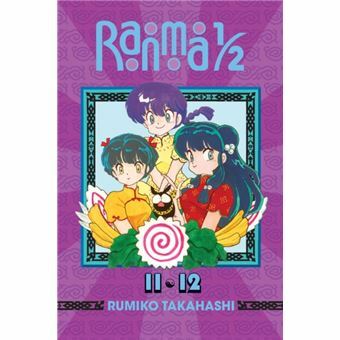 Contains volumes 11 and 12! Furinkan High gets a new principal with some very radical ideas about student discipline and a rather unexpected relationship with blustering upperclassman Kuno. Then, poor lovesick Ryoga finally gets a break when a magical bar of soap cures his porcine transformations. If it's not too good to be true, then it won't all come out in the wash.